7 Clinical Relevance – A Bit Tongue Tied? Most muscles serve to attach one bone, usually via a tendon, to another. 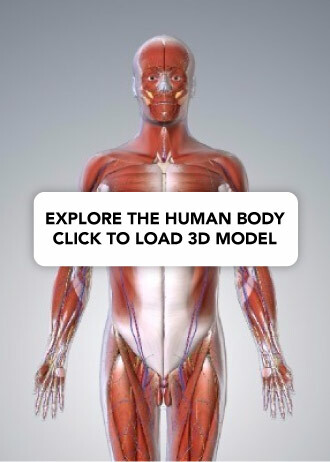 There are a few places where that is not entirely true: the ocular muscles, the scapulothoracic joint, the diaphragm and perineum are all good exceptions. However, the tongue is extraordinary. A boneless mass that you can protrude at will, fold, invert, lay flat or fill the mouth. In this article, we shall look at the structure of the tongue, its vasculature and innervation. The intrinsic muscles only attach to other structures in the tongue. There are four paired intrinsic muscles of the tongue and they are named by the direction in which they travel: the superior longitudinal, inferior longitudinal, transverse and vertical muscles of the tongue. These muscles affect the shape and size of the tongue – for example, in tongue rolling – and have a role in facilitating speech, eating and swallowing. Motor innervation for the intrinsic muscles of the tongue is via the hypoglossal nerve (CNXII). Innervation: Motor innervation via the hypoglossal nerve (CNXII). Innervation: Motor innervation via the vagus nerve (CNX). All of the intrinsic and extrinsic muscles are innervated by the hypoglossal nerve (CN XII), except palatoglossus, which has vagal innervation (CN X). 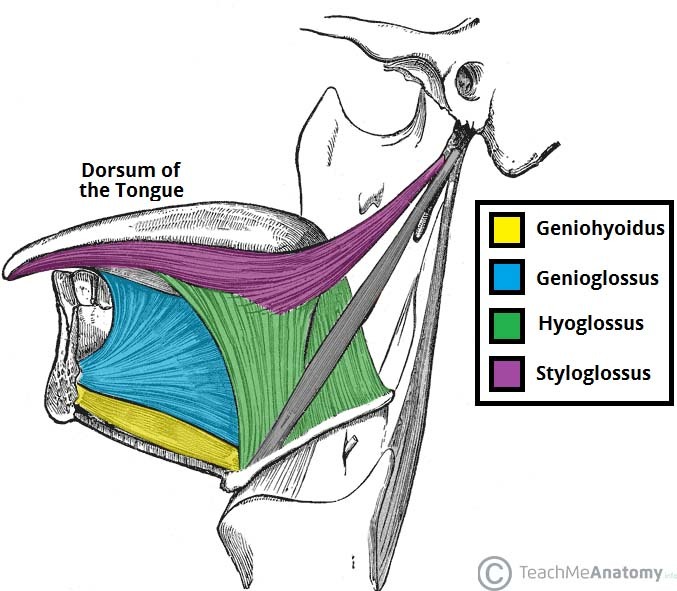 Fig 1 – The extrinsic muscles of the tongue. Note the palatoglossus muscle is not included in this illustration. Once we start examining the sensory supply of the tongue, we need to start looking at its division into an anterior , and a posterior ⅓. Later in this article, when we discuss the development of the tongue, the reason for this boundary becomes clear. 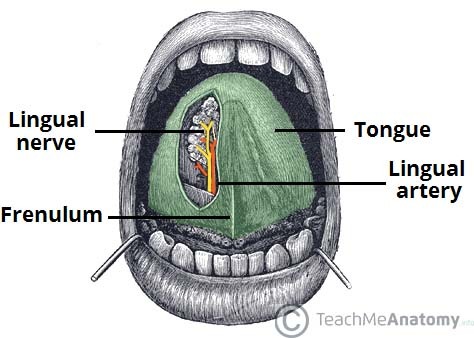 Fig 1.2 – The lingual nerve provides sensory innervation to the to the 2/3 of the tongue. In the anterior 2/3, general sensation is supplied by the trigeminal nerve (CNV). Specifically the lingual nerve, a branch of the mandibular nerve (CN V3). On the other hand, taste in the anterior 2/3 is supplied from the facial nerve (CNVII). In the petrous part of the temporal bone, the facial nerve gives off three branches, one of which is chorda tympani. This travels through the middle ear, and continues on to the tongue. The posterior 1/3 of the tongue is slightly easier. Both touch and taste are supplied by the glossopharyngeal nerve (CNIX). The lingual artery (branch of the external carotid) does most of the supply, but there is a branch from the facial artery, called the tonsillar artery, which can provide some collateral circulation. Drainage is by the lingual vein. A good understanding of the tongue’s embryological development greatly simplifies the complex innervation to the structure. One of the central points is that the first branchial arch is supplied by the trigeminal nerve, the second by the facial, the third by the glossopharyngeal, and the fourth and sixth by the vagus. When the tongue is developing, it starts as a two longitudinal bulbous ridges, with contribution from the first four branchial arches. These ridges join, giving rise to the longitudinal line (median sulcus) down the centre of your tongue. The contribution from the second branchial arch is grown over by that of the third arch, but the nerve supply remains. Using this information, we can understand why the majority of the tongue’s innervation is by the trigeminal nerve (CN V) and the glossopharyngeal nerve CN IX. Look further towards the back of your tongue – there is a transverse line near the root of the tongue. This is called sulcus terminalis, and in the centre, where it meets the median sulcus, there is a pit. This is the now-closed top of a deep pit, the foramen cecum (blind window), at the end of which lies the thyroid gland. During development, this descends from the tongue down into the neck, If, on the way down, the pit (thyroglossal duct) doesn’t close behind the gland, midline thyroglossal cysts or fistulae may remain. Clinical Relevance – A Bit Tongue Tied? The tongue is attached anteroinferiorly by a piece of connective tissue called the frenulum, which lies in the midline. The process by which the frenulum is formed is the same by which your fingers are made, and is known as sculpting apoptosis. Just as some people may have webbed fingers if this process fails, it can result in excess frenulum. This is called being ‘tongue-tied’, and presents in children. There are varying degrees of severity of tongue-tie and in some cases it can restrict the movement of the tongue causing difficulties with breast feeding. This can be managed with simple surgery. What attaches the inferior aspect of the tongue to the oral mucosa? Which nerve is responsible for the majority of taste sensation?